Make an alkalizing shift from meat to veggies! This vegan recipe for Beet and Black Bean Croquettes can also be used to make your own veggie burgers. Whether you serve them up as patties or croquettes, you are alkalizing (reducing dietary acid intake) by avoiding meat and increasing your fiber, vitamin, mineral and phytonutrient intake. That’s a win win situation in and of itself, but the real reason to enjoy these is because they are so frickin’ yummy! Add a creamy topping of Artichoke Aioli and a pretty green garnish- I used cilantro – and you’ve got a classy, delicious appetizer. Top a bed of greens with a few of these and drizzle with dressing and you’ve got a filling salad. Form them into veggie patties, cook them up and top with Cilantro Lime Sauce, avocado and tomato for a Latin-influenced vegan burger! You can serve them on a bun- but I suggest you serve them wrapped with lettuce instead to avoid the high-glycemic, processed flour. The swap of buns for greens will keep your buns looking better! This recipe works well as veggie burgers, but my preferred way to serve them is as croquettes on a bed of spinach topped with a little Artichoke Dip. Start rice and let it cook while you diced the root vegetables. Toss the root veggies in liquid coconut oil ( you may need to warm it to make it liquid) and 1/2 tsp salt. Transfer veggies to a roasting rack over a sheet pan. Roast for 15 to 2o minutes or until tender. Put the cooked rice, roasted veggies and the remaining ingredients in the food processor. Pulse until well combined, but still a little chunky. If you over process the croquettes/patties will be tough to flip! Transfer the mixture back to the mixing bowl and refrigerate to let the favors meld. After as little as 2o minutes refrigeration you can form the croquettes/patties. Heat a skillet on medium high heat with 1 to 2 tablespoons coconut oil. Once the skillet is hot, place the croquettes in the pan and let them brown slightly on each side. Serve hot, consider topping them with Artichoke Aioli with cilantro leaves as garnish for a delicious treat. 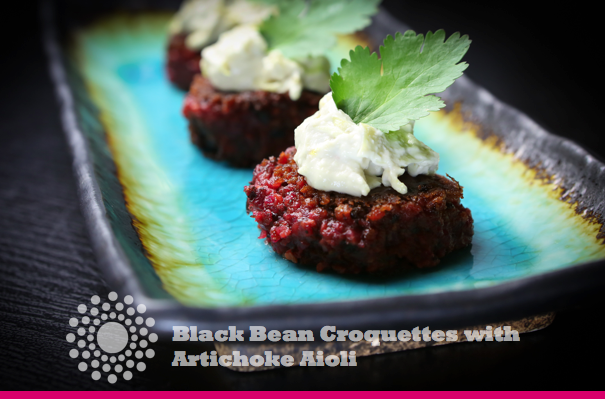 I would love to try making your Black Bean Corquettes with Artichoke Aioli, but I couldn’t find the recipe for Artichoke Aioli. Could you tell me where to fine this? Posting Now, check by by this afternoon and you will be all set! You would have to use a recipe calculator to get that exact information. I am more of a believer in counting chemicals than counting calories. Since this is chemical-free, I am a happy camper. If you want to enter all the ingredients for this, or any recipe, check out the recipe calculator at Spark People. You will find it easy to use and pretty accurate from what I can tell. This was absolutely delicious!!!!!!! We didn’t have any cashews for the aioli but macadamia nuts worked just fine.